Allergic subjects produce relatively low amounts of IFN-γ, a pleiotropic Th-1 cytokine that downregulates Th2-associated airway inflammation and hyperresponsiveness (AHR), the hallmarks of allergic asthma. Adenovirus-mediated IFN-γ gene transfer reduces AHR, Th2 cytokine levels and lung inflammation in mice, but its use would be limited by the frequency of gene delivery required; therefore, we tested chitosan/IFN-γ pDNA nanoparticles (CIN) for in situ production of IFN-γ and its in vivo effects. CIN were administered to OVA-sensitized mice to investigate the possibility of using gene transfer to modulate ovalbumin (OVA)-induced inflammation and AHR. Mice treated with CIN exhibit significantly lower AHR to methacholine challenge and less lung histopathology. Production of IFN-γ is increased after CIN treatment while the Th2-cytokines, IL-4 and IL-5, and OVA-specific serum IgE are reduced compared to control mice. AHR and eosinophilia are also significantly reduced by CIN therapy administered therapeutically in mice with established asthma. CIN was found to inhibit epithelial inflammation within 6 hours of delivery by inducing apoptosis of goblet cells. Experiments performed on STAT4-defective mice do not show reduction in AHR with CIN treatment, thus implicating STAT4 signaling in the mechanism of CIN action. These results demonstrate that mucosal CIN therapy can effectively reduce established allergen-induced airway inflammation and AHR. Asthma is a chronic lung disease characterized by elevated allergen-induced inflammation of the airway, typically with infiltration of a number of inflammatory cells such as eosinophils and epithelial hyperplasia leading to hypersecretion of mucus. The chronic inflammation may lead to structural alterations of the airway, airway remodeling and also to increased airway hyperresponsiveness (AHR), the latter is usually reversible with treatment. IFN-γ, a pleiotropic cytokine, promotes T-helper type-1 (Th1) responses, which downregulate the Th2-like immune responses that are hallmarks of allergic diseases, including asthma [1, 2]. IFN-γ is considered to be a potential candidate for asthma therapy because of its capacity to decrease: (i) IL-13-induced goblet cell hyperplasia and eosinophilia by upregulation of the IL-13Rα2 decoy receptor, which diminishes IL-13 signaling [3, 4], (ii) LTC4 production in murine and human macrophages [5, 6], human peripheral blood lymphocytes after wasp venom immunotherapy , and in leukocytes of pollinosis patients , and (iii) TGF-β and procollagen-I and -III, which cause fibrosis and airway remodeling [9, 10]. 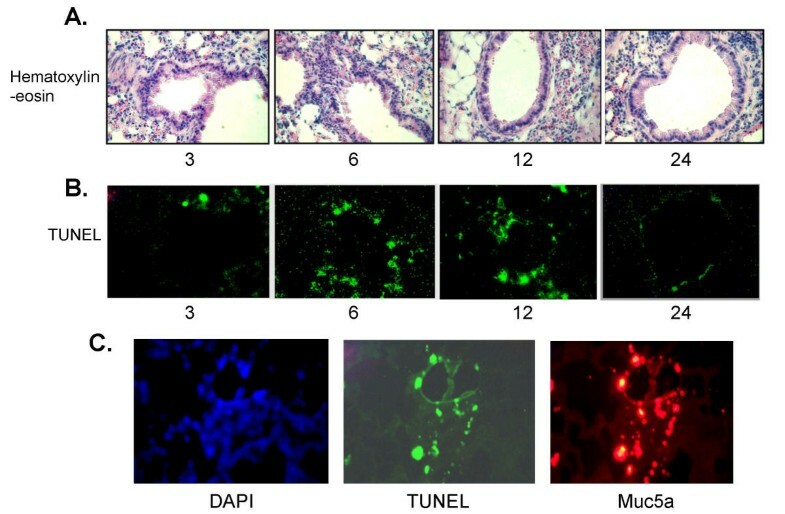 Administration of recombinant IFN-γ reverses established airway disease and inflammation in murine models [11, 12], but its use in treatment of asthma has been limited because of the short half-life of IFN-γ in vivo and the potentially severe adverse effects associated with high dose administration . These drawbacks can be circumvented by the use of IFN-γ gene transfer which inhibits both antigen- and Th2-induced pulmonary eosinophilia and airway hyperreactivity [14, 15]. The protective role of plasmid DNA (pDNA)-encoded IFN-γ gene transfer in a mouse model for respiratory syncytial virus infection and the role of IFN-γ as a genetic adjuvant in the immunotherapy of grass-allergic asthma  have previously been reported. However, the pDNA-mediated gene transfer for asthma has been hindered by the lack of an appropriate delivery system and also when performed under physiologically permissible conditions, gene expression is inefficient especially in non-dividing cells such as epithelial cells. An intranasal IFN-γ gene therapy approach for asthma treatment was reported using adenovirus-mediated IFN-γ gene transfer, which decreased AHR, Th2 cytokine levels and lung inflammation . This approach, also, is limited by the potentially acute inflammation of the airway caused by the viral infection, and the frequency of gene delivery required due to elimination of the virus by the immune system. We therefore reasoned that a non-viral intranasal IFN-γ gene delivery using chitosan nanoparticles  may provide an effective approach for asthma treatment. Chitosan, a natural, biocompatible cationic polysaccharide prepared from crustacean shells, has shown great potential as a vehicle for gene delivery [20–25]. In this study, we examined the effects of chitosan-IFN-γ pDNA nanoparticles (CIN) using a BALB/c mouse model of allergic asthma. The results show that CIN therapy significantly inhibits the production of IL-4, IL-5, ovalbumin (OVA)-specific serum IgE, airway inflammation, and hyperreactivity. Female 6 to 8 week-old wild type and STAT4-/- BALB/c mice from Jackson Laboratory (Bar Harbor, ME) were maintained in pathogen-free conditions at the University of South Florida College of Medicine vivarium. All procedures were reviewed and approved by the committees on animal research at the University of South Florida College of Medicine and VA Hospital. IFN-γ cDNA was cloned in the mammalian expression vector pVAX (Invitrogen, San Diego, CA), and complexed with chitosan, as described before . Briefly, recombinant plasmid dissolved in 25 mM Na2SO4 was heated for 10 min at 55°C. Chitosan (Vanson, Redmond, WA) was dissolved in 25 mM Na acetate, pH 5.4, to a final concentration of 0.02% and heated for 10 min at 55°C. After heating, chitosan and DNA were mixed, vortexed vigorously for 20–30 sec, and stored at room temperature until use. Control mice were treated with chitosan nanoparticles in the absence of DNA, with chitosan nanoparticles complexed with empty vector, or with naked DNA alone. Mice were given 25 μg of chitosan-IFN-γ nanoparticles intranasally (i.n.) per mouse on days 1, 2 and 3. Control mice were given PBS, chitosan alone or IFN-γ plasmid alone. On day 4, mice were allergen-sensitized by i.p. injection of 50 μg of ovalbumin (OVA) adsorbed to 2 mg of aluminum potassium sulfate (alum). On day 19, mice were challenged intranasally with OVA (50 μg per mouse). On day 22 following the last challenge, AHR to methacholine was measured in conscious mice. On day 23, mice were bled and then sacrificed. Lungs and spleens were removed and single-cell suspensions of splenocytes were prepared and cultured in vitro in the presence of 100 μg/ml OVA or in medium alone. Mice were sensitized i.p. with 50 μg OVA (adsorbed to alum) on day 1 followed by intranasal challenge with 50 μg of OVA on day 14. On days 21–23, test mice were given 25 μg of chitosan-IFN-γ nanoparticles i.n. per mouse. Control mice were given PBS, chitosan alone or IFN-γ plasmid alone. Mice were further challenged i.n. with OVA (50 μg/mouse) on days 27 through 29 and AHR was measured on day 30. Mice were bled and sacrificed on day 31, and spleens and lungs removed. Airway hyperresponsiveness to inhaled methacholine was measured in conscious mice using a whole body plethysmograph (Buxco, Troy, NY), as described before . Results are expressed as mean enhanced pause (PENH) ± SEM as percent of baseline (PBS only). Mice were sacrificed and lungs were lavaged with 1 ml of PBS introduced through the trachea. The BAL fluid was centrifuged 10 min at 300 × g, cells were rinsed with PBS and resuspended. Aliquots of the cell suspension were applied to slides using a cytospin apparatus (Shandon Southern), stained and examined microscopically. Cells were identified by morphological characteristics. Single-cell suspensions of splenocytes (3 × 105 cells/well of a 24-well plate) were stimulated in vitro by incubation with 100 μg/ml OVA. Supernatants were collected after 48 hours and ELISAs for IL-4, IL-5, and IFN-γ were done using kits from R & D Systems (Minneapolis, MN). To determine the titer of OVA-specific IgE, a microtiter plate was coated overnight at 4°C with 100 μl of OVA (5 mg/ml). Following three washes, nonspecific sites were blocked with PBST (0.5% Tween-20 in PBS). Mouse sera were added to the antigen-coated wells, the plates were incubated, and bound IgE was detected with biotinylated anti-mouse IgE (02112D; Pharmingen, CA). Biotin anti-mouse IgE (02122D) reacts specifically with mouse IgE of the Igha and Ighb haplotype and does not react with other IgG isotypes. Streptavidin-peroxidase conjugate was added and the bound enzyme was detected by addition of the substrate tetramethylbenzidine and reading absorbance at 450 nm. Mice were sacrificed 24 hours after the last OVA challenge, lungs were perfused in situ with PBS, removed, fixed in 4% buffered formalin, paraffin-embedded and sectioned. Lung inflammation was assessed by microscopic examination of sections stained with hematoxylin and eosin. Unstained sections were examined for expression of the goblet cell-specific marker Muc5a and for apoptosis by the TUNEL (terminal deoxynucleotidyl transferase dUTP nick end-labeling) assay method (DeadEndä Fluorometric TUNEL Assay, Promega Corp., Madison, WI), as described . Briefly, lung sections were dewaxed in xylene, rehydrated, and fixed with 4% paraformaldehyde for 15 min. Sections were then washed three times in PBS, permeablized 15 min with 0.1 % Triton X-100, and incubated one hour at 37°C with the TUNEL reagent. The reaction was terminated by rinsing slides once with 2X SSC and three times in PBS. Sections were then incubated with antibody to Muc5a, washed and incubated with phycoerythrin-conjugated secondary antibody. The lung sections were observed microscopically and fluorescence photographed using a Nikon TE300 fluorescence microscope and digital camera. Values for all measurements are expressed as means ± SEMs. Groups were compared by ANOVA and through the use of paired Student's t tests. Differences between groups were considered significant at p < 0.05. To determine the type of lung cells expressing the chitosan-delivered genes, plasmid DNA expressing a green-fluorescent protein (GFP) was administered intranasally (i.n.) to mice. One day later, the lung sections from one group of mice and the cells in BAL fluid from a parallel group of mice were examined for GFP expression by fluorescence microscopy. Lung sections showed that the GFP was expressed principally by epithelial cells, while in BAL fluid, monocytic cells expressed GFP (Fig. 1A). To examine the time course of gene expression, CIN or chitosan alone was administered to groups of mice (n = 3) and the level of expressed IFN-γ was determined by analysis of lung homogenates from each group 1, 2, 4, 6, 8 or 10 days after CIN administration. The results show that CIN rapidly induces IFN-γ expression and the level continues to increase until day 4. However, by day 10 the IFN-γ in the lung is back to the base level (Fig. 1B). Administration of chitosan alone had little effect. These results show that intranasal CIN administration promotes IFN-γ production in the lung and that expression primarily occurs in lung epithelial cells and monocytes. Chitosan nanoparticles target lung epithelial and monocytic cells. (A) BALB/c mice were treated i.n. with chitosan nanoparticles containing pGFP. After 24 h, mice were sacrificed and their lungs were fixed and sectioned by cryotome. Sections (15 micron) were thaw-mounted to slides and viewed for green fluorescent protein ('Lung'). BAL cells were fixed after cytospin on a slide and visualized by fluorescence microscopy to identify GFP-expressing cells ('BAL'). 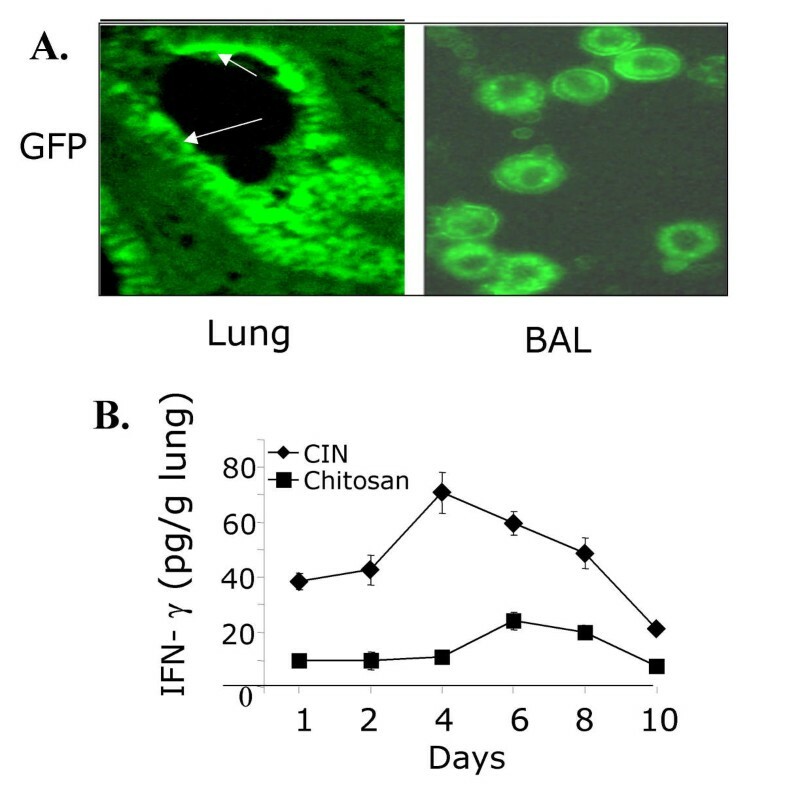 (B) CIN administration induced IFN-γ production in the lung over a period of 10 days. 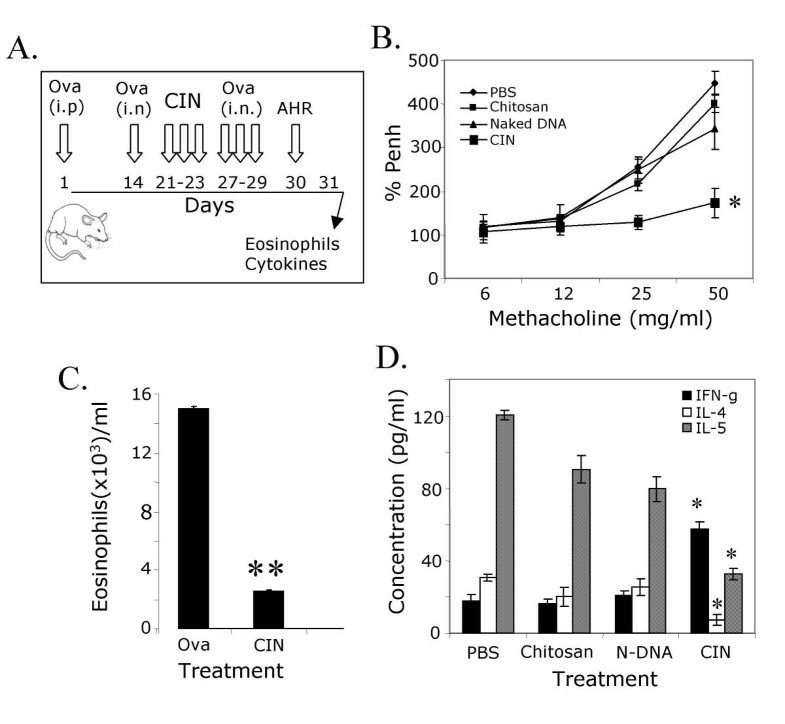 Lung homogenates were prepared from mice after 1, 2, 4, 6, 8, or 10 days of treatment with CIN (25 μg/mouse) or chitosan alone, and IFN-γ levels were determined by ELISA (n = 3). IFN-γ promotes a Th1-like response to allergens. 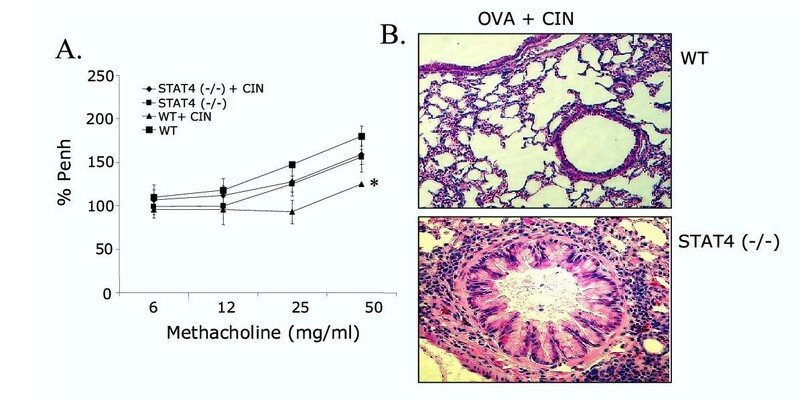 To determine whether prophylactic administration of CIN attenuates sensitization to allergens, mice were first given CIN therapy and then sensitized and challenged with OVA (Fig. 2A). The effect of CIN therapy on airway hyperreactivity was measured by whole body plethysmography. CIN-treated mice showed a significantly (p < 0.01) attenuated AHR (% Penh) compared to non-treated mice or mice given the IFN-γ plasmid alone as naked DNA (Fig. 2B). Furthermore, analysis of the cellular composition of the BAL fluid from CIN-treated mice showed a doubling of monocytes, while in the lungs there were significant reductions in the numbers of eosinophils (Fig. 2C). Histological examination of lung sections (Fig. 2D) revealed that CIN-treated mice exhibited a significant decrease in epithelial denudation, mucus cell metaplasia, and cellular infiltration compared to non-treated mice or mice given naked IFN-γ plasmid. Prevention of AHR. (A) Prophylaxis protocol. (B) Mice were challenged with methacholine on day 22 to measure airway responsiveness. The values are mean enhanced pause (PENH) expressed as percent of baseline ± SEM (* P < 0.05 and **P < 0.01). (C) On day 24, BAL was performed and differential cell counts were obtained ('mac', macrophages; 'lym', lymphocytes; 'neu', neutrophils; 'eos', eosinophils). (D) On day 24, lungs were removed, sectioned and the sections stained with hematoxylin/eosin ('PBS', phosphate-buffered saline control; 'N-DNA', naked DNA without chitosan; 'CIN', chitosan-DNA complex). Differential cell counts and examination of tissue sections were performed by different persons in a blinded fashion. Representative results are shown. To determine whether the reduction in AHR in CIN-treated mice was due to attenuated allergen sensitization, Th2 cytokines were measured in splenocytes from the three groups of mice. The CIN-treated mice showed significant reduction in the amount of IL-5 and IL-4 compared to control mice (Fig. 3A and 3B). In contrast, IFN-γ secretion was significantly higher in CIN treated mice compared to control mice (Fig. 3A). CIN-treated mice also showed a significant reduction in IgE antibody levels compared to the control group (Fig. 3C). These results indicate that CIN prophylaxis results in the attenuation of allergen sensitization. CIN alters production of cytokines and IgE. On day 23 of the prophylactic procedure (see Fig. 2A) spleens were removed and single-cell suspensions of splenocytes were prepared. Cells were cultured for 48 h with OVA, and the levels of secreted IFN-γ and IL-5 (A) and IL-4 (B) were measured. Total serum IgE was measured on day 23 (C). Values are means ± SEM (*p < 0.05, **p < 0.01). Intranasal Ad-IFN-γ is capable of reversing established AHR. To determine whether therapeutic administration of CIN can attenuate established asthma, mice were first sensitized and challenged with OVA and then given CIN therapy, as shown in the protocol (Fig. 4A). Airway hyperreactivity (%Penh) was measured by whole body plethysmography (Fig. 4B) and CIN-treated mice again had lower AHR than those mice given chitosan alone or IFN-γ plasmid alone. The results show a complete reversal to the basal level of AHR in the group of mice that were treated with CIN. The number of eosinophils in the BAL fluid showed a significant reduction in the CIN treated mice (Fig. 4C) compared with the untreated control group by staining the lung sections with antibody against Muc5a, a marker that is specific for mucus-producing cells. Furthermore, analysis of cytokine secretion from splenocytes showed that there was an increase in IFN-γ production and a decrease in IL-4 and IL-5 production in the CIN-treated mice compared to the controls (Fig. 4D). Reversal of established AHR and eosinophilia. (A) Therapeutic protocol. (B) Mice were sensitized i.p. and challenged i.n. with OVA and treated with CIN as described. AHR was measured 24 h after the last challenge (n = 4). CIN-treated mice exhibited reduced AHR compared to the controls. Data are mean enhanced pause (PENH) expressed as percent of baseline ± SEM (*p < 0.05). (C) On day 31, BAL was performed and eosinophils in BAL fluid were counted (**p < 0.01). (D) On day 23, spleens were removed and single-cell suspensions of splenocytes prepared. Cells were cultured for 48 hours in the presence of OVA and cell supernatants were analyzed for IFN-γ, IL-4 and IL-5. Mice receiving CIN showed more IFN-γ and less IL-4 and IL-5 compared to the chitosan-only control. Data are means ± SEM (*p < 0.05). To determine whether CIN therapy decreases established pulmonary inflammation, lungs from OVA-sensitized and OVA-challenged mice were examined 3, 6, 12 and 24 h after CIN administration. Histopathologic analysis of the bronchial epithelium showed that mucosal cell hyperplasia began to attenuate after 6 h of CIN administration (Fig. 5A, H&E). Staining of lung sections for apoptosis (TUNEL assay) showed a significant number of TUNEL-positive cells at 6 and 12 h after CIN administration, which was back to normal by 24 h (Fig. 5B, TUNEL). In Fig. 5C, the cells undergoing apoptosis (TUNEL) were identified as goblet cells by staining the lung sections with the mucus cell-specific marker, Muc5a. These results indicate that CIN reverses epithelial inflammation rapidly within hours. CIN treatment induces apoptosis of goblet cells. BALB/c mice (n = 3) were sensitized and challenged with OVA as in Fig. 4 and then treated i.n. with CIN. Mice were sacrificed at 0, 3, 6, 12 and 24 h after CIN treatment and lungs were removed, sectioned and stained with hematoxylin/eosin (Fig. 5A), or unstained sections were analysed for apoptosis by TUNEL (terminal dUTP nick end labeling) assay (Fig. 5B). A final set of lung sections (Fig. 5C, 6 h time point) was stained for the goblet cell-specific protein Muc5a, and for apoptosis by the TUNEL assay. The first panel shows staining of nuclei with diamidinophenylindole (DAPI). Ad-IFN-γ gene transfer, which produces significant amounts of IFN-γ in the lung, has been shown to involve the IL-12/ STAT4 signaling pathway . To determine whether CIN also uses a STAT4 pathway, CIN therapy was tested on STAT4-deficient mice (STAT4-/-). Wild type mice showed the expected reduction in %Penh with CIN treatment while the STAT4-deficient mice had no significant change in AHR after CIN treatment (Fig. 6A). Lung histopathology analysis of wild type and STAT4-/- mice treated with CIN showed that CIN did not protect the lungs of STAT4-/- mice (Fig. 6B) against inflammation. These results suggest that STAT4 signaling is critical to the effectiveness of CIN therapy. CIN therapy involves the STAT4 pathway. OVA-sensitized BALB/c wild type (WT) and STAT4-/- knockout mice (n = 4) were given CIN therapy intranasally and challenged with OVA. (A) AHR in response to methacholine was measured one day after the last challenge. The values are means ± SEM (*p < 0.05). (B) Mice were sacrificed the day following AHR measurement and their lungs were removed, paraffin-embedded and stained with hematoxylin/eosin. The role of IFN-γ in modulating allergen-induced asthma has been described by many investigators, including our laboratory [19, 26, 28]. Using mouse models, a variety of approaches have been tried, ranging from i.p. administration of recombinant IFN-γ to adenovirus-mediated gene transfer [11, 12]. However, none of these approaches may be suitable for utilizing IFN-γ therapy in humans. In this report, a non-viral intranasal gene transfer strategy is described using a human-friendly gene carrier, chitosan. The results in a mouse model of allergic asthma demonstrate that CIN therapy is potentially an effective prophylactic and therapeutic treatment for asthma. Evidence is also presented that, the immune modulation of CIN therapy is STAT4 dependent. Although chitosan has been previously administered intranasally, the pattern of gene expression in the lung mediated by plasmid DNA adsorbed to chitosan nanoparticles has not been determined. The results of this study show that the bronchial epithelium is the major target of chitosan nanoparticles. In addition to epithelial cells, macrophages appeared to also take up chitosan nanoparticles. Both of these cell types play an important role in asthma and in immunomodulation . A major drawback of the adenovirus-mediated gene transfer is that entry into bronchial epithelial cells requires the Cocksackievirus and adenovirus receptor (CAR), which is expressed on the basolateral, but not the apical, surface of epithelial cells. Mucus may also interfere with adenoviral gene transfer, whereas chitosan has been shown to have muco-adhesive properties . The role of monocytes is important, as monocytes are activated in response to IFN-γ production, which leads to IL-12 production and amplification of the IFN-γ cascade. The time course of IFN-γ expression through delivery of CIN is also distinct from that of adenoviral-mediated IFN-γ expression in that the amount of IFN-γ expression is only about two-fold higher than the basal level, but the duration of IFN-γ production is prolonged. A significant finding was that treatment with CIN reversed the course of asthma, as is evident from the normalization of AHR and the return to normal lung morphology from the hyper-inflammatory condition induced by OVA sensitization and challenge. This result is consistent with our previous observations and those of others. Furthermore, the reduction in eosinophilia was greater with CIN therapy than with Ad-IFN treatment. 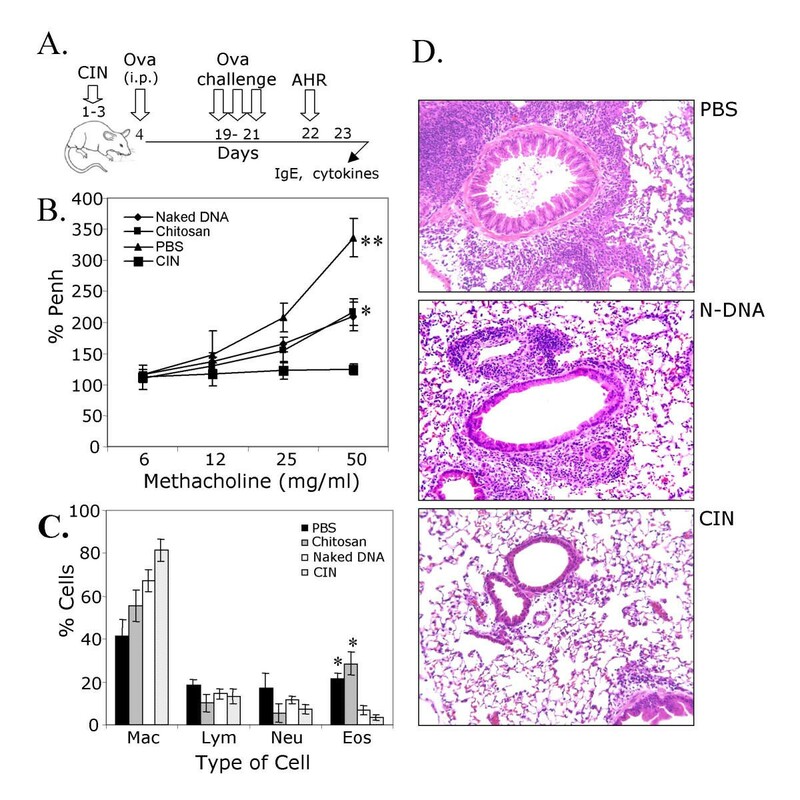 A novel finding is that chitosan IFN-γ works within 3–6 h after intranasal administration, as mucus cell metaplasia was reduced as early as 6 h after treatment. This reduction is seen despite the fact that CIN therapy produces about 10-fold less IFN-γ than Ad-IFN-γ treatment. The effective transfection of lung epithelial cells by CIN may account for this increased effectiveness. CIN therapy appears to induce IFN-γ gene expression predominantly in epithelial cells, and the reduction in AHR and goblet cell hyperplasia may be due to IFN-γ directly or may involve other Th1 cytokines such as IL-12. Two additional cytokines, IL-23 and TCCR (T cell cytokine receptor), have been reported to exhibit IL-12-like effects in that they also activate the transcription factor STAT4 [32–34]. Therefore, to further verify the importance of the IL-12 signaling pathway in mediating CIN effects, the role of STAT4 was examined using STAT4-/- mice. No significant difference in AHR was observed between OVA sensitized/challenged STAT4-/- mice and OVA sensitized/challenged and CIN-treated STAT4-/- mice. Also, epithelial damage and inflammation in the lung was not attenuated in STAT4-/- mice compared to the wild type control. These results are in agreement with the findings that IL-4 levels and Th2 cell numbers remain unchanged in asthmatics with or without therapy. Studies with ex vivo spleen cells from STAT4-/-/STAT6-/- double-knockout mice demonstrate the existence of a STAT4-independent pathway for the development of Th1 cells . Whether this occurs in vivo is not yet known. T-bet, which promotes Th1 commitment in an IL-12/STAT4-independent manner, is suppressed by IL-4/STAT6, but induced by IFN-γ [37, 38]. The involvement of a STAT4-independent pathway in mediating CIN effects requires further investigation. These results demonstrate that CIN therapy effectively reduces the functional and immunological abnormalities associated with allergen sensitization and challenge and that this effect is predominantly mediated via a STAT4 signaling pathway. Moreover, because of the similarities between mice and humans in the T cell differentiation pathway, these results indicate that CIN may be capable of reversing allergic asthma in humans. These results are significant given the limitations of therapy with recombinant IFNs or adenovirus-mediated gene transfer, and CIN therapy could be tailored to the needs of individuals who differ in their level of IFN-γ production and responsiveness. In conclusion, intranasal CIN therapy may be useful for both prophylaxis and treatment of asthma. None of the authors of this paper have competing interests. MK and AB cloned the IFNγ plasmid and performed the initial studies presented in figures 2 through 4. XK contributed to data shown in figure 1 and 6. GRH performed the experiments shown in figure 5. RFL collaborated on the project. SSM conceived, developed and designed the experiments and assisted in data analysis. All authors have read and approved the manuscript.